Milk contains vitamin A, D and E, some proteins and fats. Our skin will not be able to absorb those vitamins from milk through bathing (unless through consumption). However, milk proteins and milk fats do wonders for the skin by moisturising it. It also helps to soothe dry itchy skin during cold weather. It is important to use whole milk for milk bath. Skim and low fat don't work as well as whole milk because the milk proteins and milk fats are what we want. As for green tea, it is well known for its anti-oxidant properties either through consumption or topical use. Its sun protection properties are also well documented. 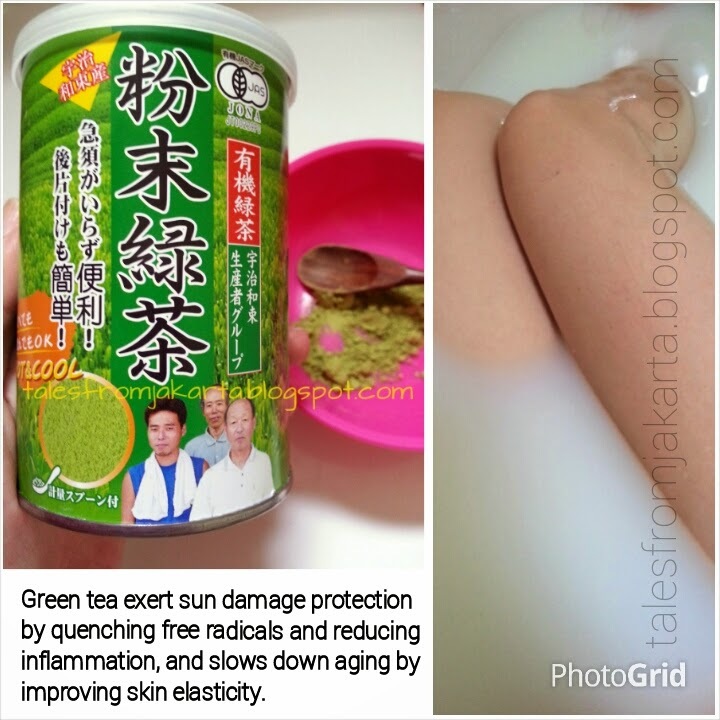 Therefore, in my morning bath routine, I always include green tea as an extra sun protection. Snow fungus - a natural loofah to gently exfoliate my face while soaking in the bath. 1. Run a warm bath. 2. Stir 3 tbsp of green tea powder with warm water in a mug. If using teabags, infuse them in hot water for 5 minutes. 3. Pour the green tea into the bath water. You can also throw in the teabags if you like. 4. Just before stepping in, pour the milk into the bath water. 5. Soak for 20 minutes before rinsing it off. Apply light lotion all over your body to seal in the moisture. Tips: Letting your hair down to soak in the milk goodness helps to condition dry, brittle hair. Be sure to rinse off before stepping out of bath to avoid smelling like stale milk though.